Finished Mar 2019. Final score: 4 / 5. I've enjoyed Marissa Meyer's books. Entertaining YA sci-fi, though the main story arcs are very predictable. "Nightmare", Nova's super-villain name, has infiltrated Renegade HQ. As a double-agent, she meets Adrian, a super-hero. To be clear, this book is mostly written in the perspective of the villain (Nova / Nightmare). While deep in the middle I was no longer sure who actually were the good guys or the bad guys. That is probably how war often goes: The bad guys do not think they are the bad guys. While the book did choose to reference Nova as the villain, this seemed more of an acknowledgement that winners get to write history. The Renegades won an important battle and then took over the government. Of course, they consider themselves the heroes. Despite the interesting view hero/villain switches, and there are plenty, the strong predictability of this book is hard to ignore. Of course, Nova is going to meet Adrian, and of course the two will develop feelings for each other, and of course Nova will start to second-guess her loyalties. I kept waiting for the big reveal of hidden identities followed by a "I thought you cared!! Was it all a lie?!?!" speech. That did not happen in this book. Perhaps that will happen in the next book. In fact, nothing really important happened in this book. The big ending was mostly a whimper. No hidden secrets were revealed. Very little new knowledge was gained. Is this going to be another endless series where nothing happens just to drag out more books? I really hope not. I really hope Marissa Meyer puts in a really good twist to make the next book interesting. This story gets a bonus point purely for trying something a little different. With book inside the "villain"'s head, there is a very interesting political commentary: Are the super heroes really "super"? Or is it really suppression of the common folk -with the Renegades taking care of everything, the people simply giving up their ambitions. I'm not fully convinced the villain-view is working, but I really enjoy the author is trying. Final score: 4/5. I will be picking up book 2 and hope for an unexpected twist. If this book ends like Words of Radiance (everything gets reset for the next story), I will walk away from this series. Get this audiobook from your library with Libby. 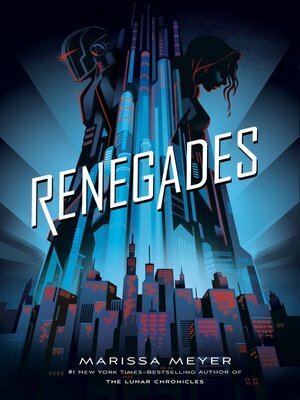 Discuss Renegades (Book 1) in the forums.